We are so excited to be announcing our first collaborative book club read! I'm sure setting aside more time to read featured on a lot of women's new years resolution lists. Here on Hanging on Every Word we will all be reading along with you, stopping each week to review and discuss where we have got and hear everyone's thoughts so far. The Schedule: Every Monday we will share our thoughts on the book and invite you to comment and ask questions. We really want this to be an engaging and collaborative experience exactly like a 'real life' book club. If you're reading along with us we want to know and we want to hear your thoughts and opinions. We will also post at the end of our review the chapters will be discuss the following week. The Book: To get the first read up and running we've decided on the first title but from then on readers will be able to suggest and vote on each book club read. 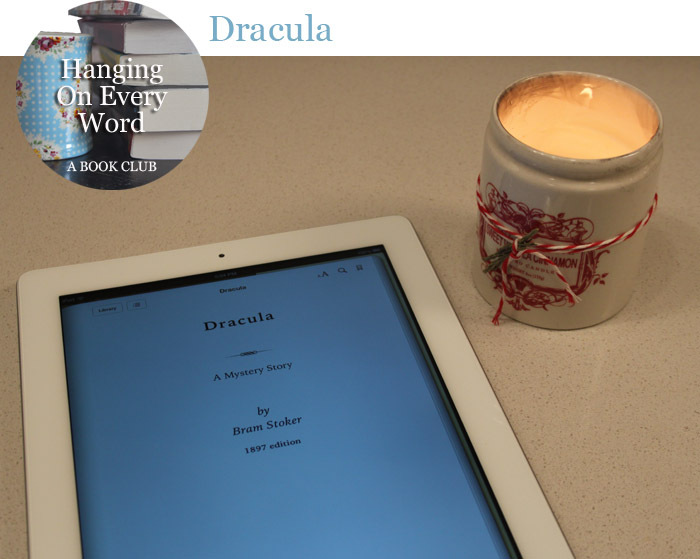 The first read will be Bram Stoker's classic, gothic novel - Dracula. So now that we've revealed the details of our first read, we'll see you back here next Monday to discuss the story up to Chapter 7. In my version that's only 107 pages. Feel free to read ahead but be mindful that we will only be discussing up to the beginning of Chapter 7 - we don't want to spoil the plot for anyone. If you have any questions or comments in the meantime we really encourage you to get in touch! Will you be joining in our first read? You've picked a great book and a truly novel one at that. It was one of the first novels to be written in the style of letters and journals.